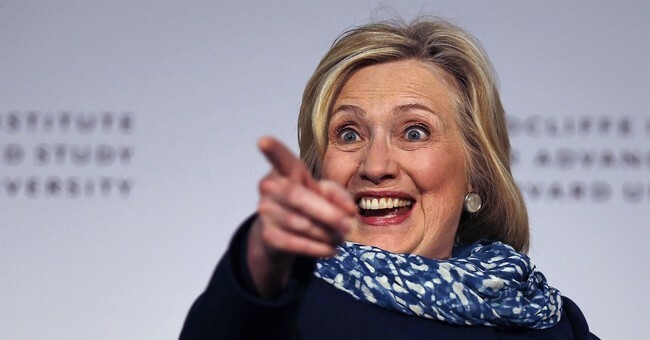 Hillary is the best Democrats have against President Trump in 2020...that's according to New York Post columnist Michael Goodwin, who says the current field of likely candidates is full of light weights, including "Spartacus" Cory Booker, and has no chance to win the White House. "Let us run through the parade of likely applicants, starting in the Senate: Bernie Sanders, Cory Booker, Kamala Harris, Elizabeth Warren, Amy Klobuchar and Kirsten Gillibrand. Anybody stand out? While there is political talent, none strikes me as a heavyweight contender who could lead the party and go toe to toe with Trump," Goodwin wrote in a recent column. "Sanders is running on vapors, Booker is a lightweight who embarrassed himself with the Spartacus shtick and Gillibrand is a ­do-nothing hack. As for Warren, CNN, showing its usual tin ear, moved her to the top of the Dem field just before she imploded with her disastrous DNA test. Her silly repetition of the now-disproven claim that she has significant Native American ancestry opens her to endless ridicule and further diminishes her ­already narrow appeal." "Others advertising their availability include Joe Biden, Eric Holder, Montana Gov. Steve Bullock, Los Angeles Mayor Eric Garcetti and former Massachusetts Gov. Deval Patrick," he continued. "Same question: Does anybody in the group look like a champion in waiting? Not to me and, to judge from the lack of great enthusiasm, not to big funders or hot-shot consultants." Goodwin further discussed the idea on Fox & Friends Monday morning. The White House doesn't seem to mind.